html context document stream nextPutAll: cachedHtml. I cache plenty of stuff in class variables as well, but at a finer grain than the component level so I generally wouldn't use a decorator. I'd directly ask for a particular fragment such as..
html html: (self fragmentAt: #header). I also cache more than just html, I cache web service results for common repetitive calls, but as you said, it's fairly trivial to do, not something I'd consider needs to be built in. Your point about caching being a multi-level approach is very apposite; I actually started by caching the results of the call to tunes.org, but when I actually used the profiler, I realised that as much time was being spent generating the html, so caching at that point was a much more productive approach. I then went looking in the WADecoration hierarchy for a memoisation decorator that I could tweak to my purposes. 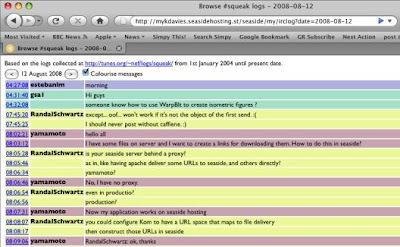 When I didn't find what is generally the canonical example of the use of decorators, I immediately got suspicious that there was another way of doing things -- I've found that if something I expect to find in a Smalltalk library isn't there, it's because there's a better way of approaching the problem.